All offline and online U.S license and regulated casinos are also required to have systems and procedures in place that can and will help players and gamblers get help and assistance if they have any type of gambling related problems too. The current landscape related to online gambling is changing over in the USA, for thanks to a Supreme Court ruling made in May of 2018, individual U.S. States can now decide for themselves whether they wish to offer online and also mobile betting and gambling facilities to their residents. That does of course mean that casino game players are going to find many casino sites now offer them the option of playing their favourite casino games online, either for real money or at no risk. In fact, offline or land based casinos are huge in number in the USA too, and it will only be casinos that are licensed and operated in individual states that will be permitted to offer legal online gambling services to their customers. One important thing to be aware of is that if you do come across a land based casino offering online casino games, is that you will need to be a resident in the state they are licensed in to access those games, as you will not be permitted to play at casino sites that are licensed in other states and not the one you currently reside in. Make no mistake about it, if you do choose to pay a visit to an offline casino and one based anywhere in America, you are going to find those venues are very stringently regulated, and with that in mind allow me to give you an insight into the many rules and regulations that they must adhere to at all times. Obviously the very first law surrounding offline casinos is that they must only allow people over the minimum age to gamble in those venues, and that age is currently 21 years of age, no one under the age of 21 is permitted to loiter around or gamble on the gaming floor of any land based casino in the USA. The games on offer must also be fully random and certified as such, and when it comes to gaming machines such as slot machines and video poker or keno machines, the software that powers those games much be verified as delivering random outcomes as too must the random number generators in those machines. One aspect of gaming machines in offline casinos which is not required are to have the long term expect payout percentages displayed upon them, which is a requirement in other countries of the world. Therefore players and gamblers are often never going to know just how high or just how low the RTP’s are on the gaming machines they choose to play. Any winnings over and above $1200 must be logged and reported to the tax authorities (the IRS) in the USA by a casino, however customers that are citizens of some other countries that are visiting a casino and win big will not be subject to having to pay tax on their winnings, due to treaties and agreements signed with those other countries by the U.S. Government. It has always been the case that players that are based in America are freely able to sign up and then play at casino sites that are based offshore and do not have a physical presence in the U.S. However, whilst no specific laws were brought in regards making it a criminal act for players to gamble at such sites, the Government did make it illegal for banking institutions to send payments and receive payments to customers holding accounts with them to and from such sites. That then led to many casino that were based offshore looking around for a range of payment options other than accepting credit and debit cards for example, and many such casino sites found it was simple to allow their U.S based customers deposit and then go on to withdraw their winnings using cryptocurrencies or even money transfer companies such as Money Gram and Western Union. There are still a very large number of casino sites that do cater primarily for American players that are based offshore, however that number is expected to drop quite significantly as more and more land based casinos across the USA opt to offer online casino games to their customers. Obviously there are some casino games available to both online and offline players in America that are way more popular with players than others, and with that in mind I will now enlighten you on just which legal casino based games are the ones that get the most attention of action from American players. 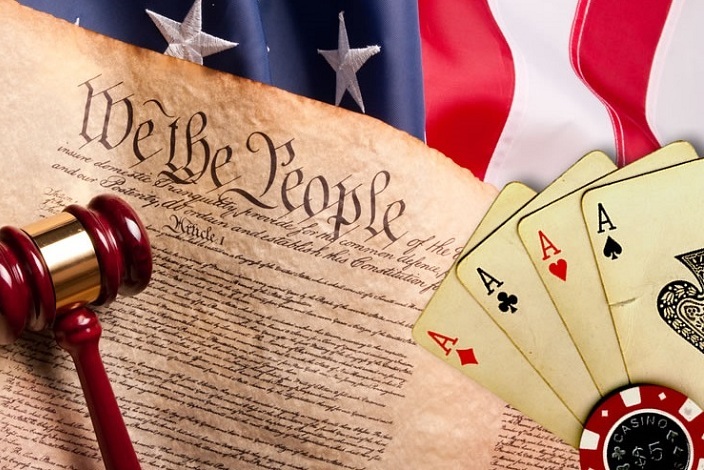 You are able to see which online US casino sites are legal to play from the US casino sites listed here. Slot machines are without a shadow of a doubt the most played games in any offline and online casinos in the USA, and they are the game category that also earns the casino the biggest percentage of their gaming income too. Blackjack is another hugely popular game played in casinos across the U.S., however players do need to be aware that the house edges achieved due to the game play rules and payouts can and often do vary from casino to casino, so they will be best advised to play the variants of Blackjack that have the lowest possible house edge. When it comes to high stake casino games, one game that has always been popular with American high rolling players is the game of Baccarat, which is a very simple game to play and requires no skill to play. Video poker machines are also quite popular with players much more so that like their fast playing structures and the high payout percentages and RTP’s those games tends to offer. Other casino games that you will find in most U.S offline and online casinos include several different variants of Roulette, Keno and also the table game of Craps however not all casinos offer Roulette and Craps games to their customers.